The Vented Vest Dog Harness V2 in Charcoal is designed with a breathable soft chest panel, this is a chest protector, non-choking harness and a car restraint, all in one. It easily connects to either a leash or a seat belt. Thanks to the mesh chest panel, your pup will be protected from scratching brush, and any pulling weight will be distributed over your pet's chest and shoulders - not the neck. 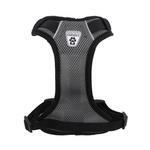 This design also makes it safe as a car restraint dog harness. For using as a car harness, simply put the seatbelt under the back strap and click it into place. This keeps your pet from distracting you but allows your pet to sit, stand and lie down. See the product closeup video for more details. Keeping your pet restrained in the car is important because confined pets won't be "back-seat drivers." Some states already require dogs to be in a crate or restrained in the back seat. Not only will this keep your pet from being a distraction to the driver, it will also keep your pet from becoming a projectile in an accident. Should your car be involved in a crash, your pet will also be safely contained in your car and unable to escape the scene and get lost or hurt. 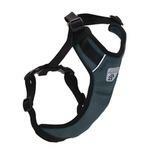 This sturdy design is great for larger dogs and pullers. The reflective piping and tag keep your pet visible in low light conditions. Vented Vest Car Seat Dog Harness - V2 Charcoal Customer Photos - Send us your photo! 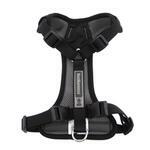 This is a very nice built harness; sturdy and appears comfortable. Posted On 01/27/17 by sarah f from , MA Yes, sarah f recommends this product! Posted On 09/27/16 by Robin R from Breckenridge, CO Yes, Robin R recommends this product! ... rather than earlier version where non-adjustable elastic used to be. We are using this harness on a new rescue pup based on our successful history with an older version. We love this gray color and hope that it wears as well as its predecessor. 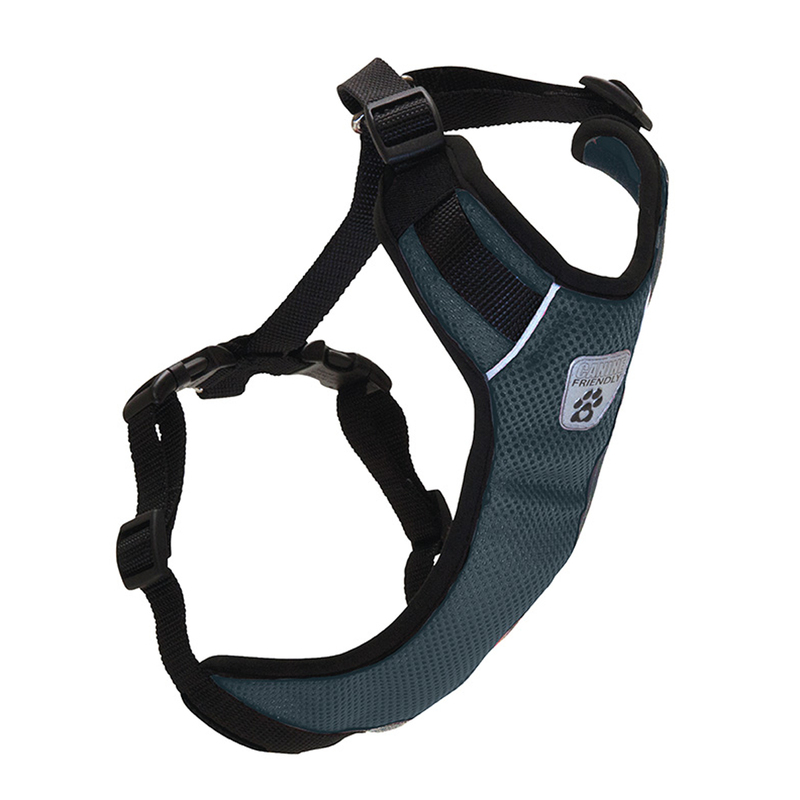 Overall, we love this style of harness as the D-ring is far back, reducing strain on the pup if he pulls. The adjustable nylon is not as "soft" or forgiving as the elastic version but we know it will break in and soften - - also will allow for more control as we meet/greet other dogs. The older elastic straps included leeway that could be dangerous during encounters with unfriendlies. As always, BaxterBoo customer service is amazing. We got the wrong size at first. 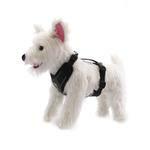 For this harness, we suggest visiting the RC Pets website (manufacturer) for their suggestion on sizing. You can't buy from them but they have info that worked better for us, re: sizing. Posted On 06/04/16 by Glenn W from West Allis, WI Yes, Glenn W recommends this product! I have been very happy with all the products I have ordered and received. Quality is great and size runs true.